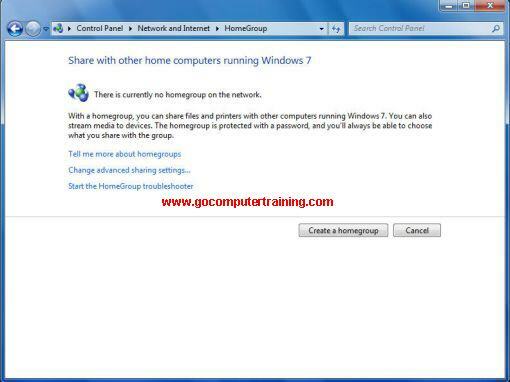 "Windows 7 Network - Discover the New Improvement on Windows 7 HomeGroup"
The Windows 7 network allows you to connect few PCs together to share the various files and resources such as network printers, scanners, and, most importantly, broadband connections to the Internet. Besides sharing files with other Windows computers, Windows also allows users to share files with other non-Windows computers, such as Mac OS and Linux users. This kind of sharing normally is setup using peer-to-peer networks in the home (referred to as a HomeGroup in Windows 7), or small-scale local area networks (LANs) and wide area networks (WANs) in business. How to connect from a PC/laptop to another to share files? You can use the traditional ethernet connection, with its network adapters and cabling, as well as the newer, increasingly popular wireless connection (commonly referred to as WiFi), with its wireless network adapters and access points (also known as hotspots). The good news is that Windows 7 is super at detecting existing private networks during installation and often requires little or no additional network setup. 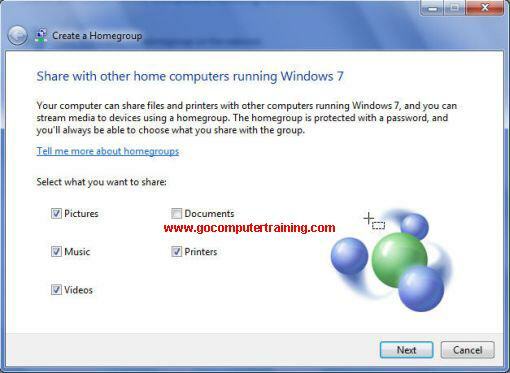 In Windows 7, Microsoft has made file sharing very simple with HomeGroup. Using HomeGroup, you can easily share files as well as music and videos with other users on the same network. For example, when you are at home, you want to be able to share files easily with other family members. Hence, the HomeGroup feature will work only if you are connected to the Home network. HomeGroup also allows you to share one or more USB printers connected to a single computer with the rest of the users on the network. Go to Control Panel and click Choose homegroup and sharing options under the Network and Internet section. From the dialog box displayed, click the Create a homegroup button. You will be asked to select the libraries and devices that you want to share as shown here. A password will be generated. Users who want to participate in this HomeGroup will need this password. Click Finish to complete the creation process. For more information about the Windows 7 HomeGroup, click here.